The Internet, and in particular, social media, increasingly impact how people’s worldviews are shaped. A majority of Americans say they get at least some of their news from sites such as Facebook and Twitter. In addition to keeping users up to date on news and current events, social media sites also offer tools to communicate about political and social activity, such as the recent #MeToo anti-harassment movement in the U.S, among many recent examples. However, although they have brought many benefits, the Internet’s social media and search platforms have proven vulnerable to political disinformation—false or misleading “facts” intentionally spread to promote deception and discord. No country in recent years has been more prolific with disinformation than Russia. While Moscow has aimed much of its digital deceit at the U.S., it has also targeted European countries including Britain, France, Italy, Germany, Spain, Ukraine, and others. With each effort, the Kremlin’s divisive narratives seek to undermine confidence in democratic institutions and exacerbate schisms over such issues as immigration, race, and religion. 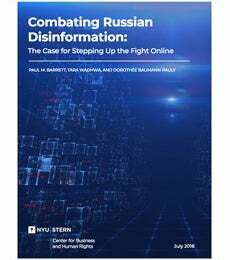 A new report from the NYU Stern Center for Business and Human Rights focuses on the dangers posed by the Russian political disinformation campaign and makes recommendations to governments and Internet platforms like Facebook, Twitter, and Google on how to address these and future threats. Staffed with experts on Russian language, culture, and Internet practices, these teams would be integrated into each company's existing efforts to address disinformation. As threats from other sources emerge, this model could be applied to them as well. Voluntary measures are not enough. The tech industry should lobby for a provision that requires disclosure of buyers of political advertising. Aspects of the current advertising-driven model are producing unintended and problematic consequences. “Whitelisting” websites for advertisers would be a step in the right direction. In the U.S., disinformation deserves the full attention of a new branch of the National Security Council. In Europe, a joint task force between the EU and NATO would help. More cross-pollination among government, the tech industry, and civil society would improve the odds that all will do a better job confronting Russian disinformation. Germany’s new “hate speech” law, containing draconian financial punishments, could lead to platforms overcompensating and squelching free speech. Read the Center’s full report.